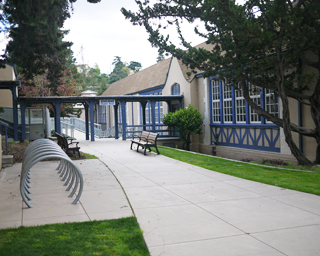 Anthony Chabot Elementary School, located in the Rockridge neighborhood of Oakland, is a public elementary school that works! Chabot’s Kindergarten through 5th grade provides its approximately 570 students with a strong academic foundation in a caring environment that fosters innovation and risk taking. Chabot is committed to ensuring that every one of our students achieves academic and social success. The teachers at Chabot, without exception, are experienced, dedicated and talented. They focus on community building to ensure that all children feel secure, nurtured, and supported by the environment and each other. Their classes blend inquiry and rigor to promote collaboration and critical thinking. With the support of parent classroom volunteers and a broad range of PTA-funded enrichment programs, students receive a well-balanced and integrated curriculum of language arts, mathematics, science, history, social studies, visual and performing arts and physical education. At Chabot, we recognize that historically American schools have not consistently been able to provide our African American and Latino children with the structures, tools, and strategies necessary for them to reach their maximum potential. At Chabot, we are committed to interrupting inequitable practices, challenging biases and creating an inclusive learning community for all. We focus on using culturally relevant, teaching practices designed to reach all learners. Our School Site Council (SSC) is focused on working with the faculty to close the achievement gap and promote the academic success for every one of our students. Chabot Elementary School strongly believes in building partnerships with all of our families knowing that when we work together on behalf of our children, anything is possible. Families are a key ingredient to a child’s academic and social success and every child needs to know that her/his family matters. It is critical for students from every kind of family to see their home lives reflected at their school in a variety of ways. Across the curriculum, we strive to increase visibility and inclusivity of all our families (e.g. LGBT, divorced, foster, adoptive, single parent) believing that all children benefit from understanding family diversity. Chabot will continue to strive for educational excellence and equity. We enjoy a strong reputation for innovation, as well as support from local businesses, and social organizations. The school’s administration, faculty and a very active parent community have succeeded in creating an exciting and dynamic learning environment at Chabot.